Outgoing Assistant to the President and Deputy Chief of Staff for Implementation Kristie Canegallo (center) presented the Healthy Campus Challenge certification to UIU Director of Counseling and Wellness Crystal Cole (left) and UIU Director of Career Development Hope Trainor during ceremonies at the White House on Friday. 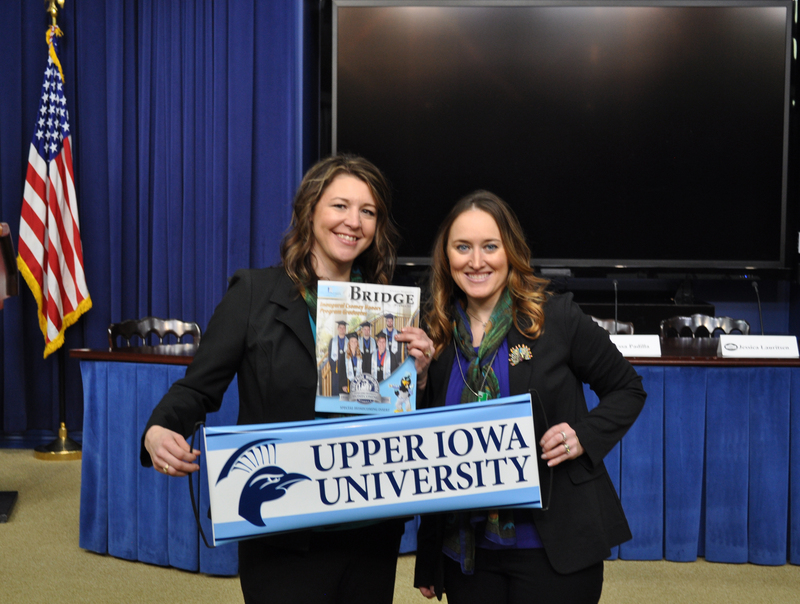 Upper Iowa University was recognized today (Friday, January 13) in Washington, D.C., for completing the White House Healthy Campus Challenge. UIU Director of Counseling and Wellness Crystal Cole and UIU Director of Career Development Hope Trainor were among representatives of approximately 60 colleges and universities from across the country selected to attend the event. Healthy Campus Challenge Day is one of the last scheduled public events to be held at the White House during President Barack Obama’s term in office. UIU staff members Hope Trainor and Crystal Cole (l-r) display their Peacock Pride before the Healthy Campus Challenge ceremony at the White House on Friday, January 13.